Alcala de Henares is a World Heritage Site located in central Spain just 35km northeast of Madrid. Conquered by the Romans in the 1st century, the city boundaries have been inhabited since the Bronze Age. The translation for Alcala de Henares means ‘Citadel on the river’, and the weather throughout the year ranges from dry, hot summers to cold winters. The main entrance to the city is the Madrid Gate. From there you can stroll along the Calle del Cardenal Cisneros which will take you to the historical centre and Santos Ninos Square. In the square is the city’s Gothic Cathedral where you will find the tomb of 17th century Spanish sculptor, Gregorio Fernandez. It is also where the Saints Justus and Pastor, two Christian schoolboys martyred in the 4th century, were laid to rest. Like many of the churches and historical buildings in Alcala there are storks nesting in the roof tops, and the Cathedral bell tower is no exception. Situated in the lowlands of the Henares River, the city is home for many migratory storks because of the availability of food and nesting material in the area. The storks and their nests are protected by an official policy and there are currently 90 pairs residing in Alcala. The Archiepiscopal Palace was once the residence of the Archbishops of Toledo from the 13th century up until the 19th century. The Tenorio Tower was added on during the 16th century as well as the palace’s main fascade which was designed by the Spanish architect, Alonso de Covarrubias. In November a traditional production of Don Juan is held in the palace courtyard. Alcala is also a major University town with a large population of international students. Founded in the 15th century, the University has a beautiful cloister and courtyards and became a cultural focal point attracting many scholars. The Colegio de San Ildefonso is equally fascinating with the original lecture rooms still in existence. Even the king’s servants had a place of study which was the old Colegio del Rey. Nearby are the convents of San Bernardo and Madre de Dios, where the Convent of Madre de Dios houses an interesting Archaeological Museum. The Oratory of San Felipe Neri has wonderful carvings adorning the inside of the church and is the only male religious order remaining in Alcala. Cervantes was the author of the famous novel ‘Don Quixote’ and was actually born in Alcala . Each year the city celebrates his birthday in October and organises the annual Cervantes festival. His house is now a museum and, typical of Castilian construction, the 17th century interior decor gives visitors a real insight into life in those days. There is also a collection of his works which include old editions of Don Quixote and numerous translations. Other places to visit are the City Hall, the Oidor Chapel, the Convent of Santa Úrsula, the Bernardas Monastery and Prado Museum. 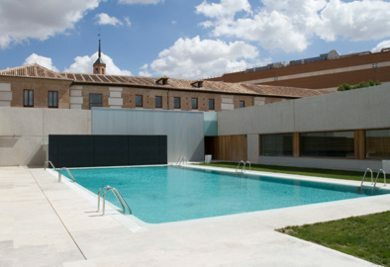 There is also an open air Museum of Sculpture and in the Plaza de Cervantes is the Teatro de Cervantes Theatre, a major open-air theatre which performs the works of some of the famous writers who studied in Alcala. Whether you are touring or just wanting a long weekend in a place of historical interest, Alcala has a lot to offer. Therefore the 17th century Convent of Santo Tomas de Aquino which is now the Parador Alcala de Henares would make a marvellous base. Although it is predominately a modern style four star hotel it has retained some of the historical features and has a seasonal outdoor swimming pool and spa.